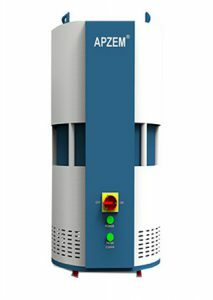 Apzem® Mini Series Laser Fume Extractors are specially designed for entry level Laser Marking and Engraving applications that generates mild fumes and fine dust particles and protects the Operators from inhaling hazardous fumes and particulate matters. Mini Fume extractors comes with three stage filtration ( optional Pre filter, Cartridge filters and optional Carbon filters that is capable of filtering out both particles as well as fumes. A compact and uniquely designed extractor catering for wide range of Marking and Engraving applications. Flow : 500 to 3000 CFM. Secondary Filter : Mini Pleat HEPA filter. Final filter : Carbon filter. Additional silencer can be provided on request.